An event related to the creation of the Coordination Council of Azerbaijanis and the beginning of the activities of the Azerbaijani school "Karabakh" has been held in Switzerland, the Azerbaijani Embassy to Switzerland said in a statement October 7. At the first meeting of the Azerbaijani diaspora organizations operating in the city of Bern, an exchange of views on their activities, current issues and upcoming tasks has taken place. Speaking at the event, the Ambassador of Azerbaijan to Switzerland and Liechtenstein, Khanim Ibrahimova, appreciated the current activities of the Azerbaijani diaspora, noted the need for organized activities of compatriots to achieve the challenges and gave recommendations to compatriots for their future activities. The Chairman of the State Committee for Work with the Diaspora of Azerbaijan, Fuad Muradov, called on members of the diasporas operating in Switzerland to show solidarity. Muradov said that the definition of strategic directions in diaspora issues will make Azerbaijani diaspora organizations one of the strongest organizations in the world. Muradov spoke about the development of a new roadmap for diaspora work. The chairman of the state committee said that the main goal is to unite all Azerbaijanis. Then the video clip entitled as "Homeland is Close" describing the diaspora movement, was presented. At the end of the event, the official opening ceremony of the Azerbaijani school "Karabakh" took place. This school is a joint project of the Ministry of Foreign Affairs and the State Committee for Work with the Diaspora and has been established with the organizational support of the Azerbaijani Embassy to Switzerland. The school will teach Azerbaijani language, history, national dances and piano playing classes. 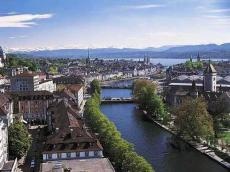 The Swiss citizens and other foreigners can also study at the school.